Ms. Thu, originally the owner of a steel shop, is new to farming. Her husband’s family (who were traditionally turmeric farmers) introduced her to turmeric farming. The combination of a competitive steel market, lowland fees, and high demand for turmeric got Ms. Thu thinking: Could investing in land for turmeric farming be a strategic business move? In 2016, she decided to give turmeric farming a try and found a plot of land. Then, her mother-in-law—who is from Chi Tan Village, famous for its turmeric farming methods—taught her everything she needed to know to get her farm started. 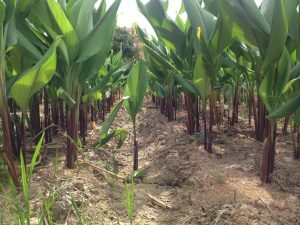 The main technique used in Chi Tan Village is the intercropping of turmeric crops with soybeans for shade and the use of straw mulch to reduce herbicide usage. Before planting, farmers mix cow manure with rice husks. They apply this mixture to the soil, allowing it to sit for ten days. Then, they plant the turmeric seeds and cover them with straw to keep moisture in as well as prevent the growth of weeds. When turmeric shoots appear (at about five cm tall), they start planting the soybean seeds (about one soybean plant per two turmeric plants) on the outside edge of each row. After the turmeric germinates, the farmers remove the soybeans. Finally, they apply the harvested soybeans the top layer of the bed as well as use them to make a new batch of compost. 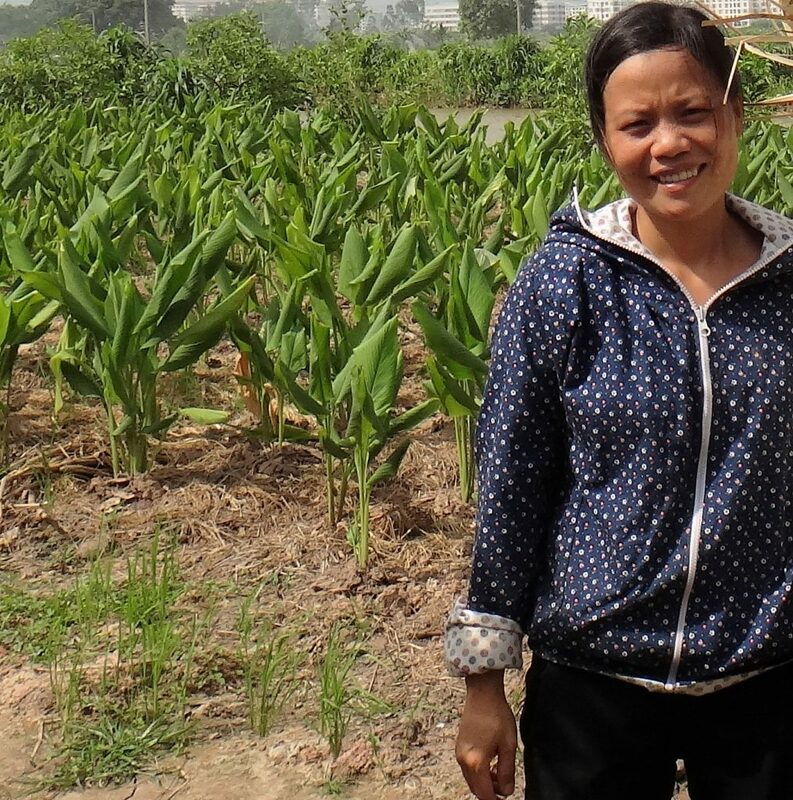 Ms. Thu is driven to continue farming by a desire to provide her community with safe and nutritious food. So far, she has succeeded using her family’s traditional turmeric farming technique, with success being measured as high yields without the use of harmful petroleum-based inputs. Not only has she been able to provide her community with safe food, she has also protected the land through the low-input farming method. Really appreciate her commitment and i wish her all success! I buy lot of turmeric from ethiopia. can she supply me some quantity of dried turmeric fingers?